There have been several very difficult things affecting this community and this country lately. They seem to be all related- each situation causes the next, then all the situations complicate all others. Climate change caused by a variety of factors seems to be contributing to a long-term drought, and this has caused the worst harvest ever, which means people are hungry. When people are malnourished, it is very difficult for them to improve their health, well-being, and resources. As a country develops, with more people, jobs, and money, such signs of development as more cars, cattle, and land stress become factors that can cause climate change like this drought. This is a cycle that many other developing countries are battling with as well. The article linked to above (click on the title to read) describes how people in Swaziland are beginning to relate the drought and bad weather with several practices that create excess carbon dioxide in the atmosphere, such as field-burning. People often set fire to their agricultural fields to clear for new crops, such as on sugar plantations and farms. The government is lax about laws against burning. In the past few weeks, the fires have spread out of control, and have been declared a national emergency in Swaziland. Other factors that contribute to the excess CO2, soil erosion, and the desertification that causes drought are monocropping, people collecting firewood for cooking over open fire (most Swazis do not have electricity), deforestation by timber and paper companies, cattle and goat-grazing, and cars. The article linked to above reports that 40% of Swaziland’s people are facing dire food and water shortages. Traditionally, rain would come from October to May, but temperatures have been higher than normal in the last 15 years, and rainfall has declined by 50%. There is drought in January, when the crops need it most- as they are ripening then. 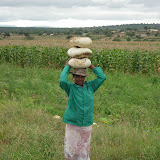 Food prices have thus inflated to be beyond the reach of even some middle-class Swazis. Also drinking water sources have been drying up, including the river nearest to Cabrini Ministries. The people hit hardest by such conditions are children, the elderly, and sick people- which represents many people here. One thing that can break this cycle is renewable energy. This means not only for Swazis but everyone all over the world. The link below discusses an initiative in Swaziland to invest in renewable energy. The major hurdle to overcome for all of us with renewable energy is the initial start-up costs- it may be higher for hydropower, solar power, and biofuels, but these forms of energy often pay back in the long run, in many ways. Another thing that really makes a difference is the generosity of individuals that step forth to help. We want to leave you with some very powerful positive images of what that can mean. With the food we receive from the World Food Programme and what we grow and purchase through private donations to Cabrini Ministries, we are able to feed the OVC children in the hostel, and 800 HIV positive patients in the community (yes, that’s right, 800 people!). Our philosophy is to keep HIV+ people healthy enough with nutrition to keep their CD4 counts up (immune system cells), and keep them off of the need for antiretroviral drugs. I never really believed in all the ‘health food eating’ stuff to stay healthy- I wasn’t necessarily a proponent of that and just felt like food was food. But I have to admit I saw people’s CD4 count going from 300 to 400 in one month once they started getting peanut butter, Morvite (which is a tasty high-protein drink that people love here), and vegetables in their diets. We eat lots of spinach and butternut squash (see photos below), and we see people’s CD4 counts go up. Our farm, and the miracle of our irrigation project that makes things grow here, were all made possible by the donations of some generous individuals. Tomatoes- do you like our stakes?